The holidays are just around the corner! They will be upon us before you can blink! It’s time to start thinking about your Christmas cards. ScrapCodes have been added to Christmas cards to share additional family pictures as well as video memories throughout the year. 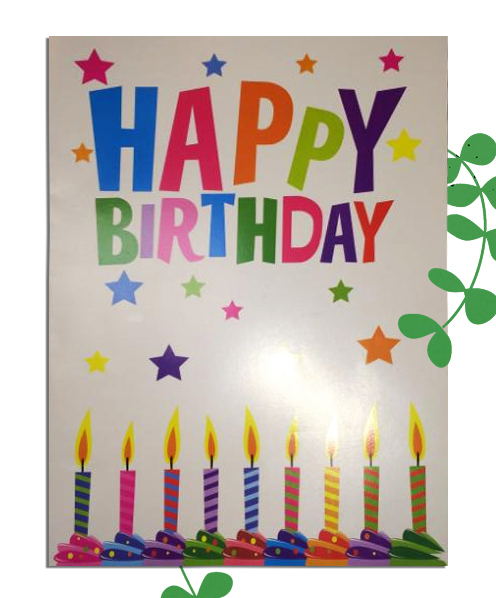 You can even add personal greetings to your cards which is what we did last year. We created our family Christmas card with a place specifically for a ScrapCode and then had them printed at the local copy store. 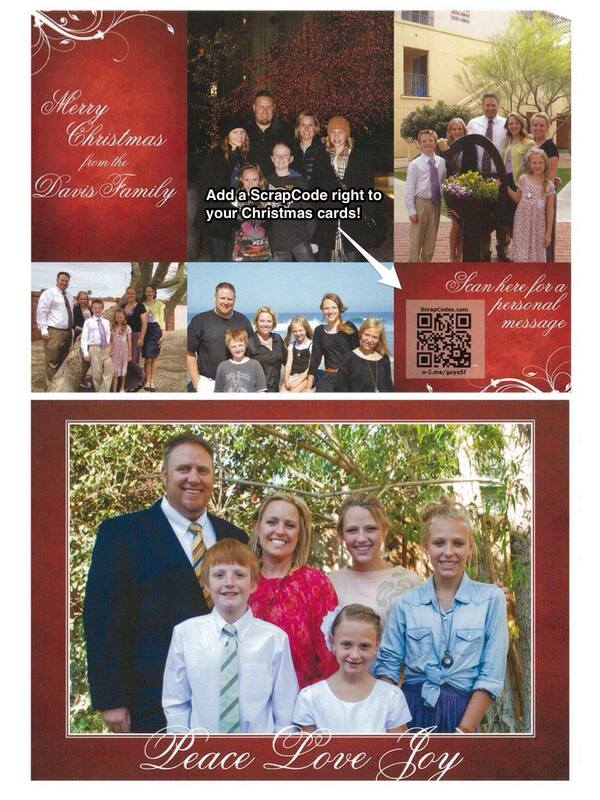 Then we customized a ScrapCode with a personal message for each family and friend that we sent our Christmas card to. It was a big hit. Everyone loved them. It took a little time to record the messages but it made every card unique and personal. Over the next few days we'll show you a few examples of how other people have used ScrapCodes with their Christmas cards. Our friend Kelly just celebrated her 50th birthday. The invitation said “No presents please”, however we wanted to do something special for her because 50 is a big deal and we just love her so much! So what did we do you ask? We bought a giant birthday card and as her guests arrived we welcomed them and asked them to record a special birthday wish for Kelly! 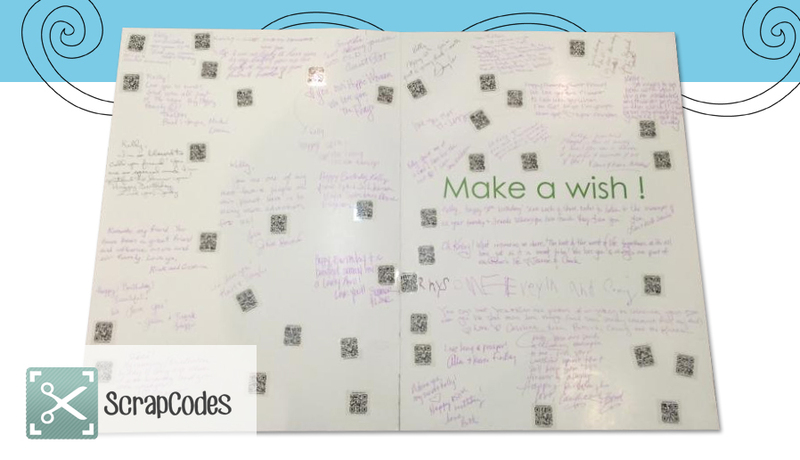 We had them sign her big birthday card and then attached a ScrapCode with each of their birthday messages. It was really impressive and Kelly loved it! We felt like we really gave her something meaningful that she will treasure for a long, long time. Wouldn’t you love to watch and listen to birthday wishes from all of your friends and family? I know I would! How are you using your ScrapCodes? Please share your ideas with the rest of us! We recently attended a family reunion at the end of the summer. Our aunt Polly invites us to her clubhouse and pool each year and we have a great time sharing stories, singing, eating, swimming and getting to know each other better. We have been doing this for just a few years now and each year we take tons of pictures and video. This year my husband created a video from last year’s reunion, added it to a ScrapCode and printed the ScrapCode on our family picture. We handed them out to all of our extended family at the reunion. As everyone scanned the ScrapCode and watched the video, it was so fun to see how much we had all changed and grown from last year. Who doesn’t like watching family movies? 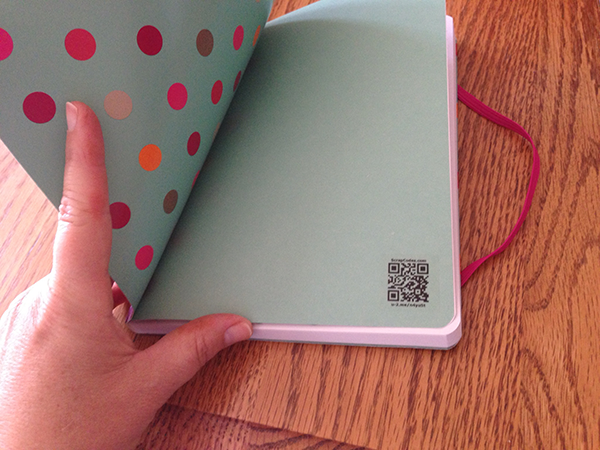 I put the actual ScrapCode sticker in my journal and wrote about the reunion. When is your next reunion or family party? Whenever it is, try using a ScrapCode to make a fun and creative take home memento! Recently my niece had a birthday. She turned seventeen! 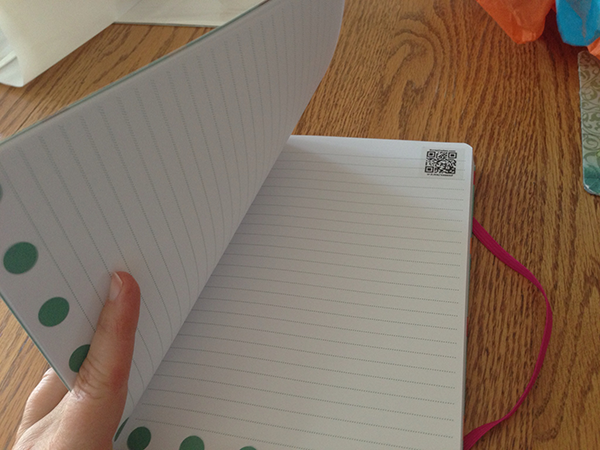 We bought a cute journal and put ScrapCodes in it! 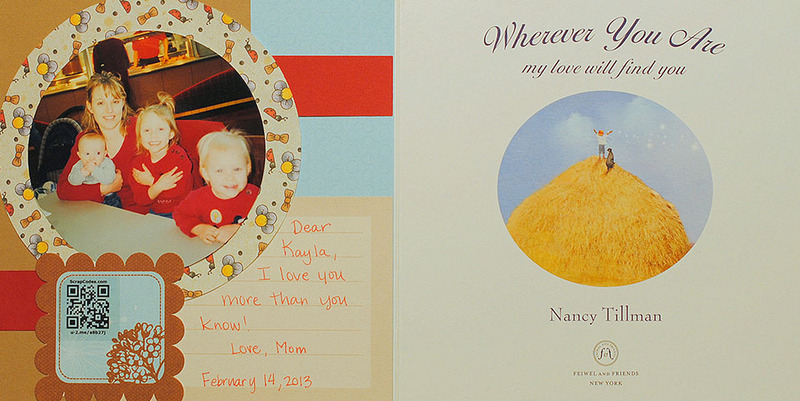 We put one in the front and made a happy birthday video message and then put them every few pages so that she can add videos, slideshows or audio clips along with her written daily history. Awesomeness!!! How cool would it be to read back through your high school journal and have pictures and videos of your friends and adventures along with your journal entries? I love it! I have put ScrapCodes in my journal now too. Our daughter just celebrated her 16th birthday!! We can't believe she can date and drive now! She got her license on her birthday! For her birthday we decided to surprise her. She has always wanted a surprise party but we were not sure how to pull it off. We ended up planning a party with a few of her friends to go to the ropes course during the day and a movie that evening with cake and ice cream at our house to follow. She was in on the plan and excited about it. However, we still wanted to try to surprise her so we rented a limo, got tickets for a show in Salt Lake City and put a ScrapCode on the invitation. It said to scan the code on the party date at 4p.m. If the code was scanned early, we put a message on that said “oops you’re too early, scan on the right day!” We changed the message every day just in case they kept checking it and for fun! On the day of the party at 4 p.m. the kids scanned the code and it told them that we were not going to the ropes course but to dress for a fun night on the town. They still did not know what we were doing. We arranged for the guests to meet at a few different locations and when the limo came to pick them up they were so surprised! We gave Kayla 4 envelopes to open at a certain time or place. Each contained a ScrapCode with a message from us. They scanned the codes with an iPad and were able to watch the messages together. The messages let them know what to do next on this adventure. The birthday party was a success; she was so excited and had so much fun. The last envelope contained a ScrapCode with a video from her friends wishing her a happy birthday. We asked one of her friends to record the messages and email them to us. We then attached them to the ScrapCode using our website, www.scrapcodes.com. They all watched it in the limo on the way home. This was really fun and easy to do with some planning and organizing ahead of time. Just think of what you can do for your next party using ScrapCodes! Today, this Scrapcode idea is one of my favorites. I love this page and the content. For my son’s 11th birthday we went to a BYU football game with a bunch of boys, our family, grandpa Davis and uncle Preston. We decided to do presents, cake and Ice cream before the game. We also painted game faces and it was really fun. So everyone sings happy birthday right? Well we have the video of us singing happy birthday to Christian right on the scrapbook page! You can even hear my daughter playing the birthday song on the piano in the back ground! This is so awesome! I love that we have this recorded and can watch it any time we look at this page. It is so fun to hear everyone singing and see him blowing out the candles. Everyone needs to do this for every child. You will love this, your child will love this and it’s so fun to see and hear all the action at the party. It’s just like being there all over again. Don’t forget to add a scrapcode with the happy birthday song and blowing out the candles to your next birthday page!!! Priceless! Ok for any of you out there who are still trying to think of something to give Moms or Grandmas for Mother’s day, I’ve got it! 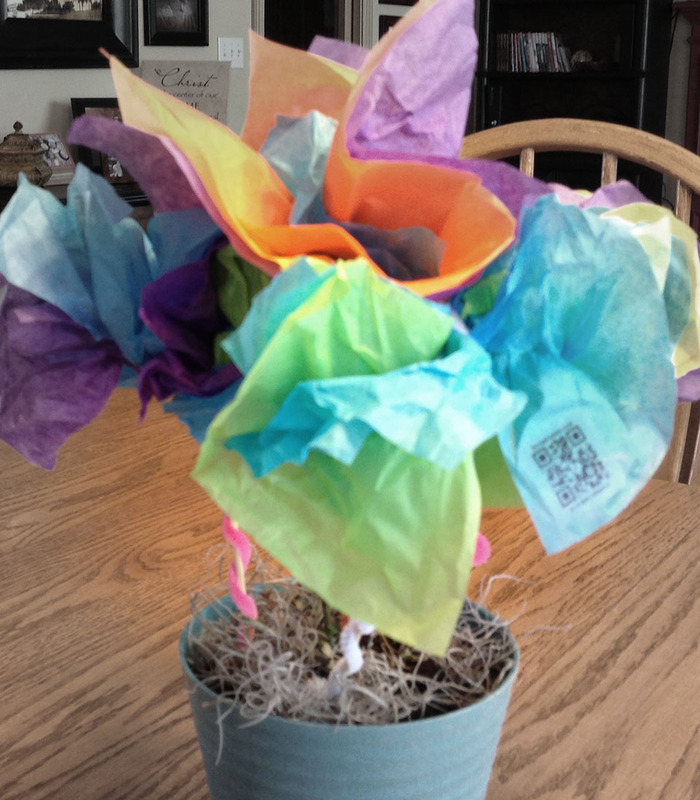 Last year my son gave me a tissue paper flower that he made at school. It is so sweet, I love it! I got to thinking, wouldn’t it be nice to have a whole bouquet of tissue paper flowers? 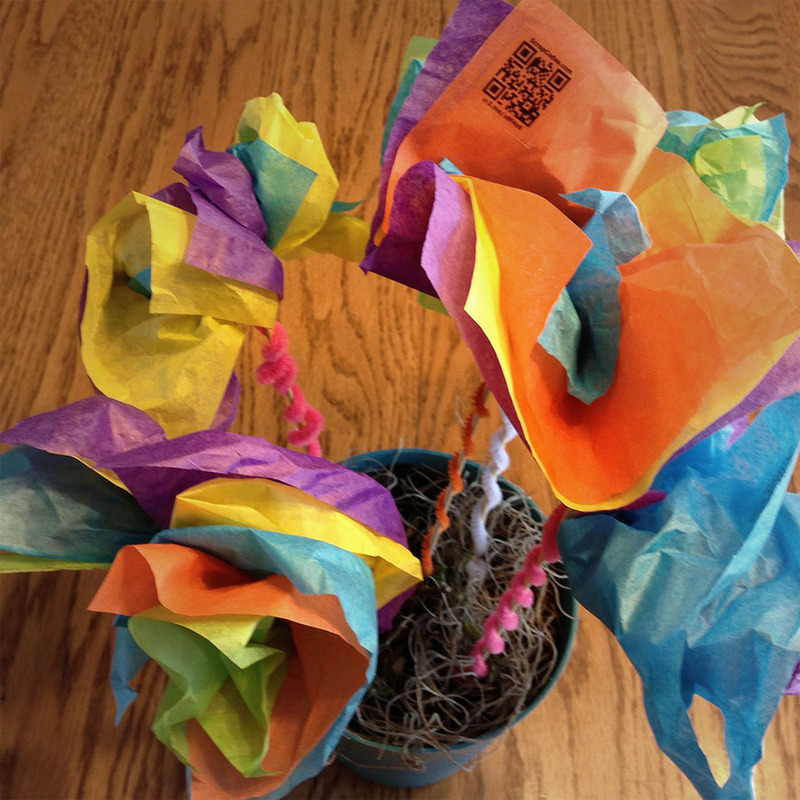 So I had each of my kids make a flower and record a video message for Grandma for Mother’s day! She is going to love it! The Scrapcode r be placed on the petals or in the center of the flower. You could also make cute flowers on scrapbook paper with your cricket cutters or whatever. Darling, original, meaningful, memorable!! All you need is tissue paper, pipe cleaners, bamboo sticks, cute kids, a vase or small plant and Scrapcodes! Cut the tissue paper into squares. Big or small depending on the size of flower you want. We used 5X5. Use four or more squares per flower in any colors you choose. Fold the papers in half and pinch in the center. Wrap the pipe cleaner around a few times to secure and then carefully separate the tissue into the shape you like. Done! I hope you like this idea for using Scrapcodes. Please continue to share your ideas with the rest of us and Happy Mother’s day to all you cute moms out there! 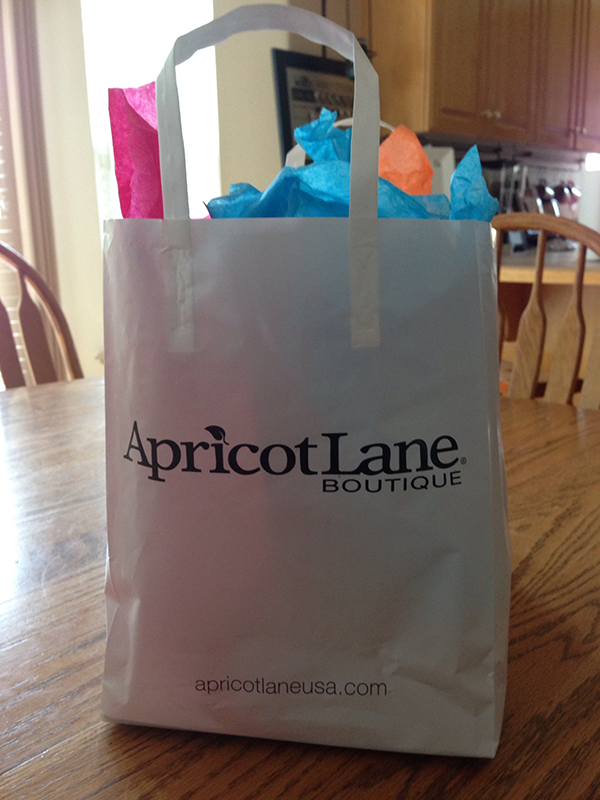 Mother's day is just about a month away! Sunday May 12, 2013. Relax, I’ve got you covered! Your Mother’s day gift is going to be so special and totally original. This week’s ScrapCode Idea is Brilliant. To go along with those flowers or candies, Simply record a video of you telling your mom how much you love her and how much she means to you. She will Love to get this personal message from you. She can watch it over and over either on her smart phone or computer. You could also use the audio media and record a favorite song or use the text media and write a poem. We got this darling tea rose plant in a bright turquoise colored pot and made a cute tag to put the ScrapCode on. I love this and know that mom will too! Make a ScrapCode video today! Today’s ScrapCode Idea: Extra Journaling. Sometimes you have a lot to say, things you don’t want to forget, but you don’t want to clutter up the page. With a ScrapCode, you can write a novel if you want! For this page I chose a favorite picture of Taylor in her baptism dress , a picture of mom and dad with her and that is it. I told the story of the day on a ScrapCode. Simple, beautiful page. Today, our youngest and last child was baptized and confirmed a member of the church of Jesus Christ of Latter Day Saints. It was a great day! All of our family and good friends came to support Taylor. (picture here) Christian and I gave talks on baptism and the Holy Ghost and three girls sang “If I listen with my heart”. (recording?) Christian did a great job and the girls sang beautifully. 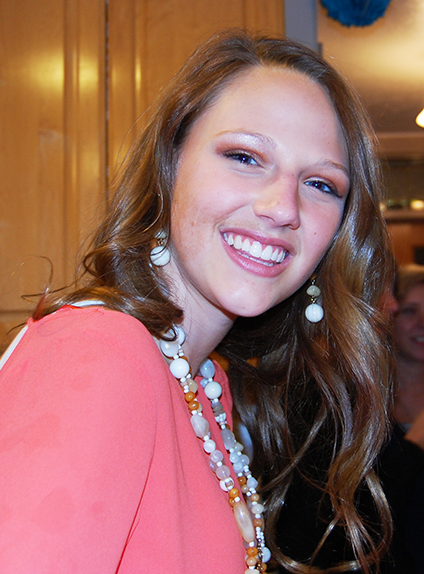 Her grandmas offered the prayers, then Rob baptized Taylor and gave a really special confirmation and blessing. Taylor said she felt so good and happy. Everything went smoothly and we were all able to really enjoy the day. After the baptism and confirmation everyone came to our home for refreshments and pictures which Sean Herde took. My good friends and family helped prepare and set everything out. I made a white cake with a rainbow ribbon. It was a great day! Summer 2011 we took a trip to the Green River with our best friends the Herdes. Oh my gosh we had so much fun! We rented a camper and drove to our grand adventure. We had a blast rafting down the river! We stopped for lunch on the side of the river and played and hung out. We made so many fun memories. Today’s ScrapCode idea is a slideshow. We had so many pictures of this trip, not all scrapbook worthy but I wanted to include them. So….drumroll…. ScrapCodes! I did one awesome action picture and then added twenty more pictures to the Scrapcode and put it right on my page. 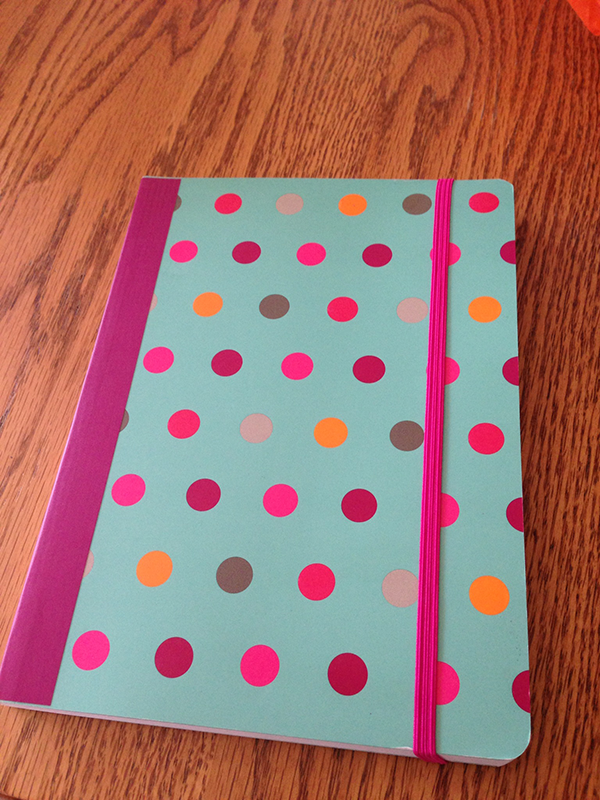 Now you can cut down on the time and work it takes to scrapbook a ton of pictures and just do one or two favorites. Add the rest as a slideshow on a ScrapCode. Fast, easy, Awesome. You’re welcome! P.S. don’t forget to show the rest of us what YOU are doing with ScrapCodes!!! Hello Scrapbook world! I want to tell you about the cutest idea I had to use a ScrapCode! I found this darling children’s book for Valentines Day. &nbspI bought one for each of my kids and decided to record my voice reading it to them. I put one picture on the inside with a handwritten message and then the ScrapCode. I read and recorded the whole story so now my kids can hear my voice any time they want. Do you love it? I know my kids are going to cherish this forever. You can do this so easy. Just go to the ScrapCodes app and choose audio for your media. You don’t even need to go buy a new book, just read your child or grandchild’s favorite book to them. Slap in the ScrapCode and you are done! Simple. I hope you like this idea. I love it! Be sure to tell us what you have used ScrapCodes for. Share your ideas! Hi my name is Lisa Davis and my husband Rob Davis and I have started a company called Scrapcodes. You may have never heard of these before. Let me tell you just how amazing these are and what in the world you do with them! 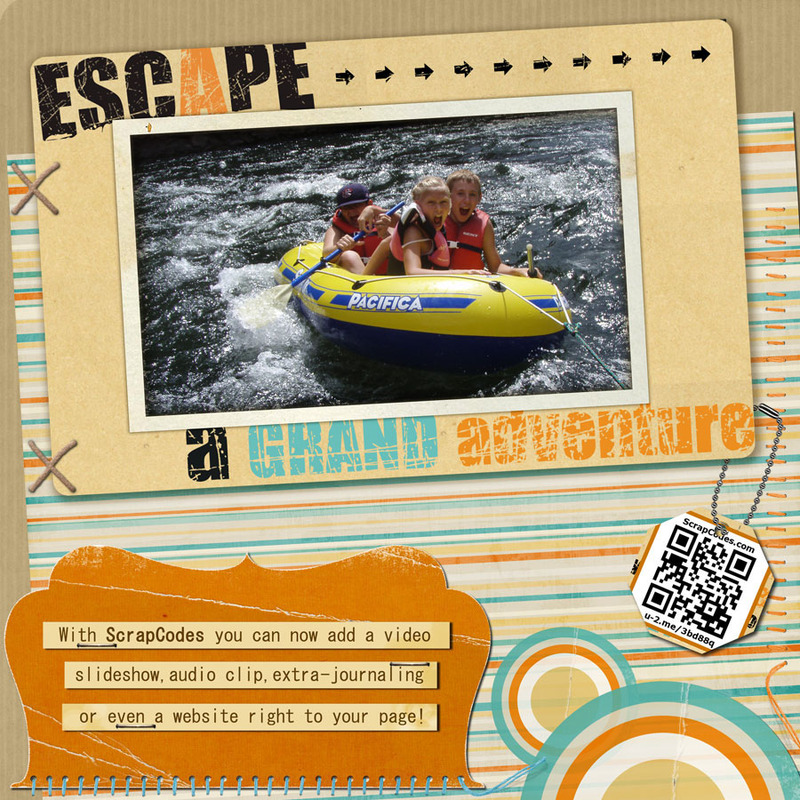 A Scrapcode is a programmed qr code that allows you to add additional media such as a slideshow, video, audio or more text right to your scrapbook page. What? That’s right, now the scrapbook world has a new tool, an awesome, innovative tool that helps you bring your scrapbooks to life! Let me give you an example of what I’m talking about. Our sweet baby Taylor was born September 6, 2004. We didn’t know if she would be a boy or another girl. We were so excited to find out! She was born c-section because her little arm was up above her head and the doctors were worried there could be some damage to her arm if she came the normal way! The nurses and Doctor thought it was pretty cool that when they checked me, she would clutch her tiny hand around their fingers! Well, she was a girl and we love her so much! I make up a little lullaby for each of my babies and sing it to them every night to put them to sleep along with some other favorites. With a Scrapcode I have included a recording of the song for Taylor on this page. Just scan the Scrapcode with your smart phone to listen to it! Did you hear me? You can listen to the song right from the scrapbook page! Now this simple page is enhanced with an audio clip that the view can listen to as they look through the scrapbook. How cool is that? Our easy app called Scrapcodes which is available as a free download for iphones and android phones has a scanner right on it. It also easily helps me to add different media to my pages. What if you don’t have a smart phone? That’s ok, just type the short url into a web browser and you can view the media right on your computer! 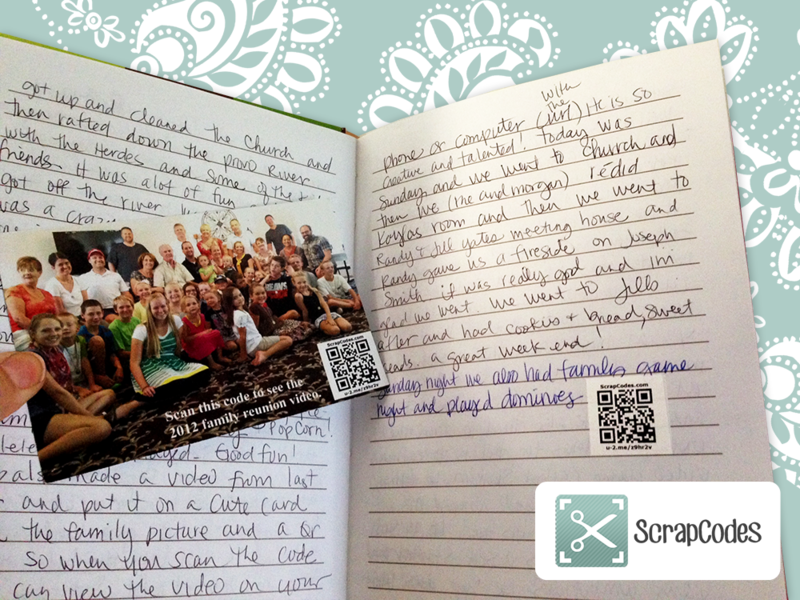 Scrappers, this is the future of scrapbooking! I can’t wait to share all of our ideas with you. 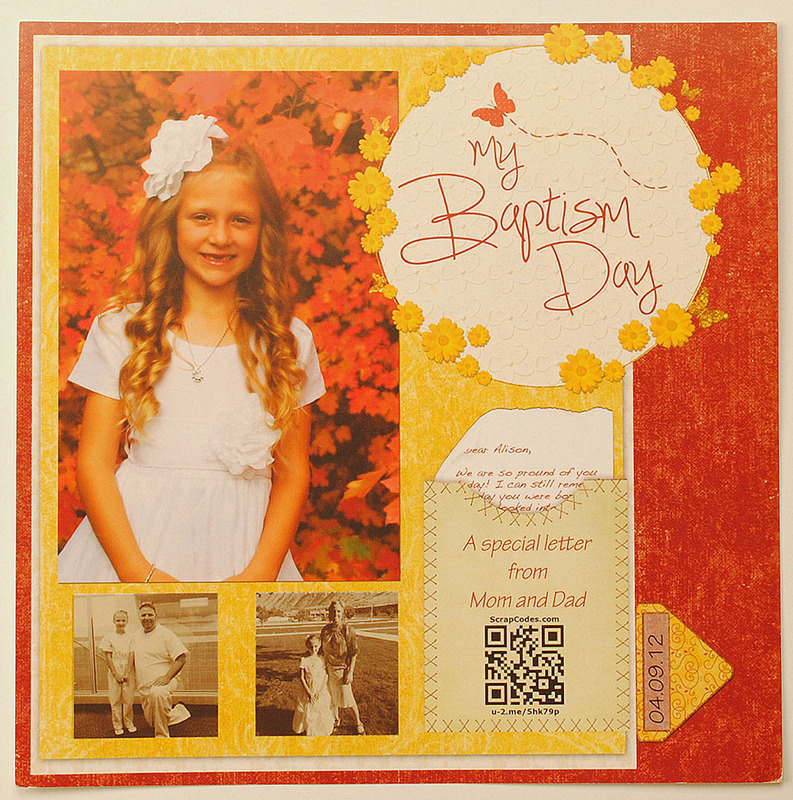 You are going to love using scrapcodes in all your scrapbooks and on all of your projects. 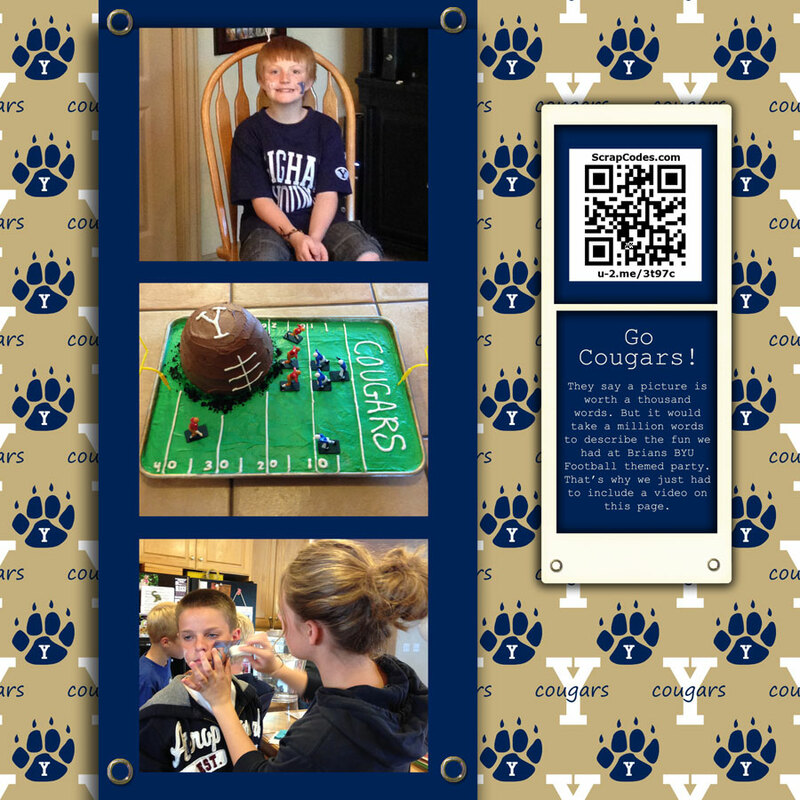 It’s fun, easy and will bring your scrapbooks to life! Look for more of my blogs and videos with new ideas weekly! Use a scrapcode!